Qualified Medicare recipients may be entitled to the VITALWRAP System at Little or No Cost. The VITALWRAP System is an automatic hot/cold water therapy system that delivers instant heat and cold therapy treatments through patented Wraps. The VITALWRAP System can be used for chronic pain, circulation improvement, and post-op surgery treatment. The VITALWRAP System uses simple tap water and heats up to the desired temperature. The VITALWRAP System is a clinical therapeutic pain management and circulatory improvement system that can be used in the home to help with diabetes, arthritis, pain management, and post-op care. It's an all-in-one system that combines heat therapy and cold therapy, allowing you to reduce edema/swelling, improve blood circulation and reduce the discomforts associated with Diabetes, Arthritis, and Surgery. Diabetics are prone to circulatory problems in their feet. The VITALWRAP System has patented designed Wraps that fit around the foot. The VITALWRAP System delivers pain relief to achy feet due to diabetic neuropathy, arthritic pain, or carpal tunnel syndrome. It is a versatile hot/cold pack that will help for both systemic pain conditions as well as part specific pain conditions (knee, back, wrist, shoulder, etc…). Universal Wraps - (for back, leg, arm, etc.) There are 3 Universal Wraps available in different sizes: 4" x 52", 6" x 60", and 8" x 72". 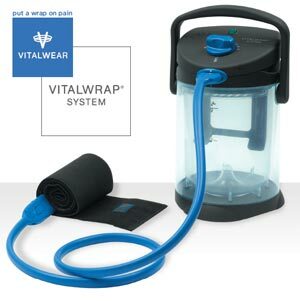 The VITALWRAP System uses 105°F water to help improve blood circulation in the back, shoulder, knee, wrist, feet, etc. Or, cold water and ice can also be used to reduce swelling and discomfort.